As you know, Mr. Monkey is our resident Travel Ninja. Tonight he scored some great flights on Virgin America to Seattle ($66) and New York City ($113) for short weekend trips later this summer. Am I a lucky girl or what? 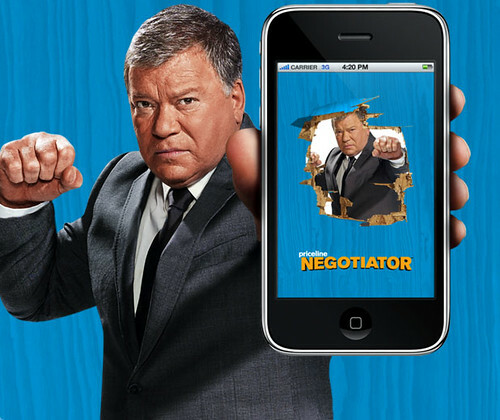 His newest toy may be of interest to you -- the priceline Negotiator iPhone App! Not only can you name your own price from your phone, but, by using the app, you can get occasional perks like having $5 credits added to your bids. The app is free, so you can become a mobile priceline Negotiator for no charge! Good luck booking your summer adventures Shatner-style! yay! can't wait for your travels because that means awesome travel posts to come! p.s. random but when said ninja, reminded me of this week's SYTYCD. do you watch that show?? if you don't, you'll have no clue what i'm talking about LOL. I love Mr. Monkey's travel tips! Thanks. downloading the aps as we speak. I'm with Tam Pham. The best part of travel ninja monkey are the travel posts that we can look forward to. Mr. Mo is so on it. Mr. Mo is da bomb. His travel tips have gotten us tons of stuff at low prices. If only we still lived in NYC. We would be all over those specials you guys get to take advantage of so often. It's always helpful to learn the ways of the (Travel) Ninja. I've never used Priceline. I'll check out their app! awesome. we tried to be travel ninjas on our last couple of trips, but we failed. We totally used this app on our road trip! got a $25 coupon after the first booking, too. bonus!